Like most cities in the Midwest, Chicago has seen its fair share of storms that have ripped through the area. What they leave in their paths can be nothing short of devastating for homeowners. During these stressful times, Custom Installations is here to help. When disaster strikes your home, it can often leave you unsure on where to turn to next. It’s always best to first have your property inspected for damage by an expert exterior contractor. They can tell you the extent of the repairs needed, how long the work will take and, most importantly, if your home is safe to inhabit. At Custom Installations, we offer thorough inspections free of charge. Once the work is ready to be completed, it is important to choose a restoration company that can handle all of the exterior work. Custom Installations is a full-service contracting firm specializing in every aspect of the home’s exterior including: windows, roofs, siding, doors and gutters. With a commitment to quality craftsmanship, our experienced crew members work diligently to ensure the new materials match seamlessly with your existing exterior. When it comes time to file your insurance claim, let Custom Installations help. We have worked with countless insurance companies to assist our clients in this tedious process. 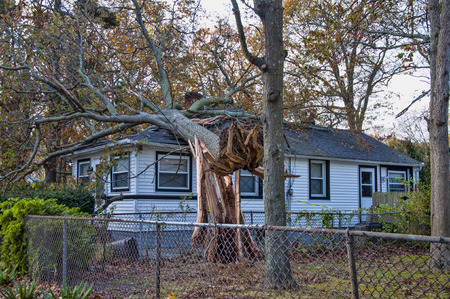 After your initial claim is filed, one of our team members will meet with the adjustor onsite to assess the damage and prepare an accurate proposal. We will continue to work closely with both you and your insurance company providing timely and thorough paperwork so your claim can be processed quickly. No matter how much we prepare, our homes can never be fully protected from Mother Nature’s wrath. During these times of stress and uncertainty trust a contractor with the expertise necessary to restore the beauty back into your home. Since 1969, Custom Installations has been helping homeowners throughout the North Shore pick up the pieces of their lives one brick at a time.